In fact, I was SO impressed that I immediately threw out the last of the brand that I had been using for the last 12 years. 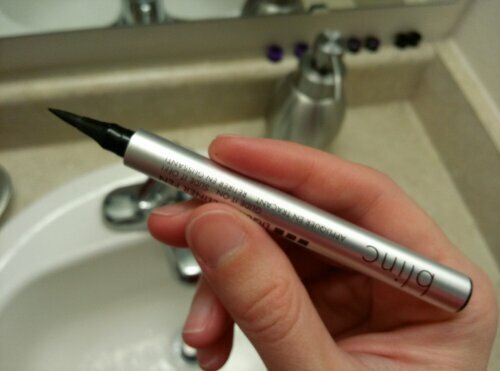 I had stuck with that brand because it lasted “16 hours”, and because it had a great cone shaped [non brush] applicator. This has the best applicator I’ve seen! It delivers the right amount of liquid to get nice opaque coverage. And the liner is JET BLACK. What’s also really great about it, is while it’s not waterproof in the traditional sense, it will NOT run. It only comes off with warm water and pressure. You don’t need eye makeup remover, and it won’t run in the rain. If your eyes water, it won’t budge. It’s absolutely fantastic. It also doesn’t smudge onto my eyelid the way my old one would after a long day.